The “Big Boy” of wheeled jump starting units has gotten an upgrade: features installed AGM batteries to increase unit longevity and eliminate spill hazards. Specifically designed for over-the-road transportation and heavy-duty implements starting applications. 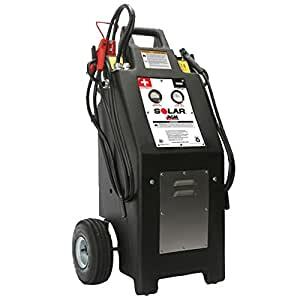 It exceeds the challenges of frigid weather and delivers the instant raw power of 1400 cold cranking amps in 12 Volt mode and 800 cold cranking amps in 24 Volt mode. Features 10 ft cable leads made of 1/0 cable to reach the starting points on vehicles of all shapes and sizes. Husband likes it. Good deal.